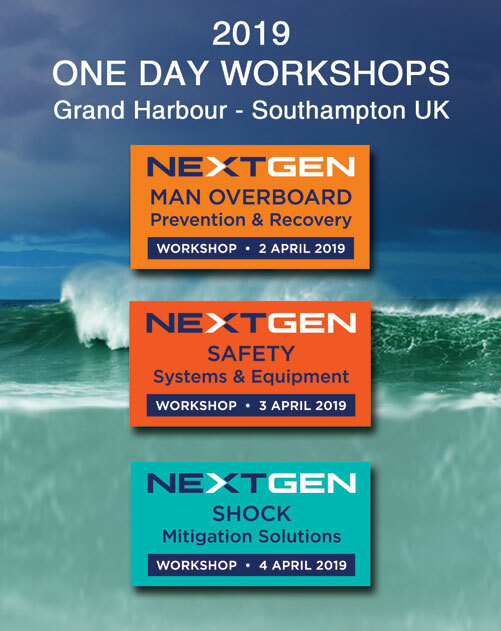 3 one day NEXT GEN Workshops will be held 'back to back' in the historic port of Southampton UK at the Grand Harbour hotel and conference venue on 2 3 4 April 2019. The safety themed NEXT GEN programme builds on experience of running specialist training sessions and bringing together a unique mix of end-user organisations, solution providers and extensive maritime expertise. An international group of experts armed with the latest knowledge will identify problems that affect the sub IMO / sub 24 metre (80 feet) maritime sector worldwide - and highlight potential solutions. The unique knowledge gained from NEXT GEN presentations and discussions will help to shape decisions that lead to improvements for in-service vessels and procurement of next generation systems that fit the evolving requirements of modern fleets in a changing world. DAY ONE - Man Overboard Workshop focuses on reducing the risk caused by people falling in the water on vessels of all sizes. All sectors are invited to participate in this unique one day event. DAY TWO - Safety Systems and Equipment Workshop focuses on 'identifying and avoiding single point of failure at sea', effective safety, innovative communications, situational awareness and the human element. DAY THREE - Shock Mitigation Solutions Workshop focuses on 'shock mitigation by all means' for professional and military organisations, boat builders, equipment manufacturers, service providers and standards organisations.